Last year, I was so surprised to discover that our very first Keto/Low Carb Challenge was featured in Women’s Health Magazine online. Hundreds joined us during that first 30-day challenge and took charge of their health and experienced fantastic results. We supported, encouraged, and cheered each other along the way. 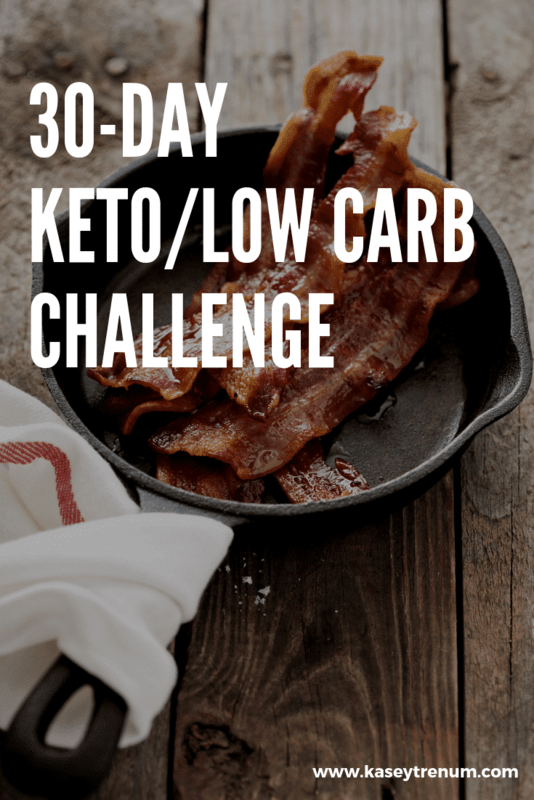 After feedback from so many of you, now that the holidays are over I am launching another Keto/Low Carb 30-Day Challenge Group on Monday, January 14th. When I am challenged and set specific goals, I tend to work harder, and I hope you will too. Couple a challenge with group encouragement and support and you have a recipe for success! There are several areas that many people tend to struggle when following either a keto or low carb lifestyle. With that in mind, we will focus on three key areas to keep it simple: hitting a net carb goal (whatever that is), drinking water, and exercising consistently. You are the boss of you; therefore, it is up to you to do the research upfront and decide how many net carbs you are comfortable eating per day. You’ll also choose your favorite exercise that fits into your life. Long-term success in any lifestyle change is first dependent on research. 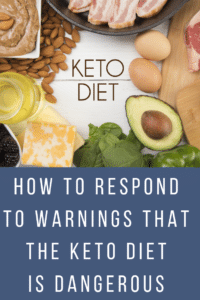 It is always great to ask questions, but if you don’t invest the time to understand a ketogenic or low carb diet, it will be hard to stick with the disciplines that are necessary to the process. With that in mind, make sure to take a look at this Guide to Getting Started with Keto. We all have to be our own best health advocates and being informed is the best place to start. The key to this Challenge is sticking with your choices consistently for 30 days then measuring your results. Our start day will be Monday, April 1st. Don’t be afraid to join with Easter coming up. This challenge isn’t about perfection for 30 days. It’s about being intentional. If you decide to take a day off for Easter it’s okay! Just jump right back in the next day. We have all failed on specific “programs” where someone tells us exactly what to eat, how much, and how often. You won’t find that here. It is important to eat real foods and to learn how to follow a healthy lifestyle change. No one wants a temporary plan that ends in failure. I will post plenty of recipes and weekly meal plans, but they are merely for inspiration, not a requirement to follow. I won’t be giving you strict rules or anything of the like. As I mentioned before, start with research then decide if you want to follow a Keto or Low Carb lifestyle. By doing so, you will learn what works best for your body and be empowered to make healthy choices that lead to long-term healthy changes. This challenge is about being purposeful, learning how to pick yourself right back up if you fall off the wagon, and giving yourself grace along the way. Unhealthy expectations and goals almost always lead to failure. Taking ownership of your challenge will set you up for success as you become your very best health advocate. First, it’s important to choose your net carb goal (or total carbs if you prefer). This amount will vary depending on if you are following Keto or Low Carb. Most who follow a keto diet allow approx 20-25 net carbs per day, while those who follow low carb may allow more. 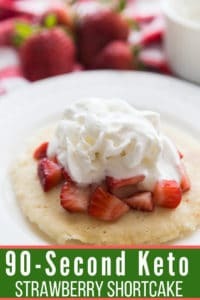 How do I Track Net Carbs? This is an area that is challenging for me because I don’t want to count and measure everything I put in my mouth. One of my goals is food freedom and keeping up with an app where I log everything I eat would cause me to focus too much on food, so I don’t personally track macros. However, I understand that tracking works for many people! Do what works for you! Installing a Keto App on your smartphone is a great place to start. You can find a list of the best Keto Apps to track macros and information about each app here. For me, I will keep up with net carbs in my head while I add healthy fats to the foods that I eat so that my fat stays higher than protein. Drinking water is essential not only for health reasons but also when trying to lose weight. My personal goal is to drink at least half my weight in water. For many, this may not be an issue, but I struggle to get the appropriate amount of water in daily. To see results, exercise takes consistent effort over time. Our focus will be some form on consistent exercise even if it is only 10 minutes a day. Many of you may already be exercising consistently and ten minutes a day sounds ridiculous. If you are in that boat, please set a goal that will be challenging. For those that are not, here is what I know; if you start exercising 10 minutes a day you’ll begin to feel stronger, and will begin to see results over time which will, in turn, make you want to exercise more. So, the goal of exercising 10 minutes a day is to start a consistent exercise habit. I created a Pinterest board of various 30-Day challenge workouts if you’d like to check them out. 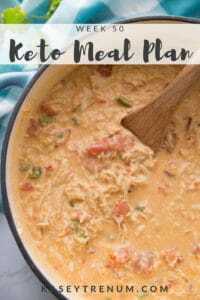 Keto Meal Plans – I post a new meal plan for inspiration every Sunday afternoon. Our start day will be Monday, April 1 and will end on Tuesday, April 30th. Go here and join my Easy Keto/Low Carb Recipes Facebook Page if you haven’t already. 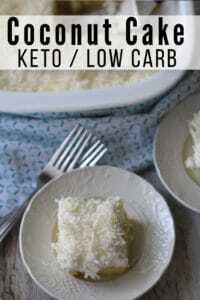 I post easy and delicious Keto/Low Carb recipes on this Facebook page daily. You don’t want to miss the weekly meal plan, food videos, and informational videos to support you on your journey. 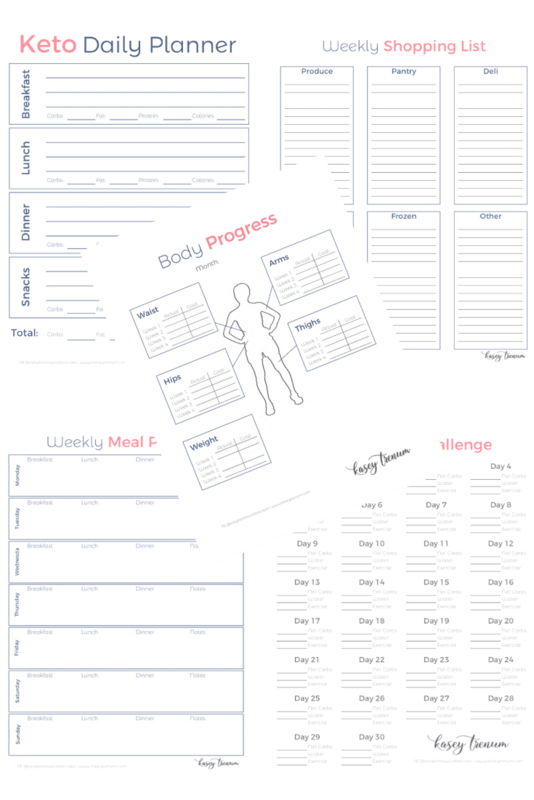 Print out the brand new Keto Challenge Printables. Fill it out according to your goals, place it in a prominent area where you will see it daily, and get ready to get started! Don’t forget your beginning weight and measurements. Taking your measurements are so important as there may be times you don’t see the results you want on the scale while still losing inches. I also included several other resources for meal planning. I created a super simple basic printable Keto Grocery List to make grocery shopping easy you don’t want to miss. Follow me on Pinterest and Instagram. I’ll be adding exercise ideas, recipes, and other helpful tips to both. Share with your friends and family who are also doing Keto/Low Carb because a challenge is always more fun with people you know to inspire and encourage you. Get ready to feel amazing and see incredible results! We can do this together! 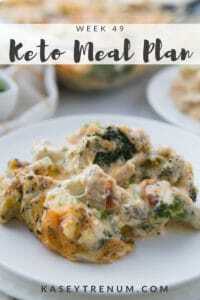 Don’t forget to print your Keto Challenge Printables! I’m so glad to know there is a big group of family KETO people trying out there together it Helps!!! So glad you joined us. You can find tons of great information online. If you google how to get started on the keto diet lots of great resources will pop up. The challenges that we do are just for support and encouragement. Here is also a great resource that might be helpful in getting started. I’m so overwhelmed where to start. Do I track in an app? Research is you best friend so that you can be your best health advocate. Here is a great place to start. what do we write in the supplements area? I get net carbs (g), water (oz) and exercise (min) but what do we put in supplements?? ty! Thank you for all that you do – much appreciated! You are so very welcome, Kim. Thank you for taking the time to comment. I really appreciate it. Yay! I’m so glad. Thanks for taking the time to share. What do you take for a probiotic? I’ve been taking AdvoCare ProBiotic Restore but have been looking at a new one a friend recommended. I can’t remember the name of the other one right now. Looking forward to doing the challenge. I always have more success with group support. Looking forward getting started with group. Sure! Glad it is helpful. I started today. Very excited too. The daily planner is really helpful. Thank you so much for that. I’m however not doing strict keto. I’m just trying to keep below 30g of carbs. I was wondering do you count carbs from vegetables? Thanks ? Yes, some veggies do have carbs so make sure to check them out so you don’t go over your target carbs. When does the next challenge start? I don’t have a date yet. Kasey, on the subject of water, you say “My personal goal is to drink at least half my weight in water.”. Water weighs approximately 8.3 pounds per gallon. Let’s say you weigh 100 pounds. Half that – 50 pounds – would equal a little over 6 gallons of water. That can’t be right? I mean, that amount of water daily would probably kill you, right? In ounces. So if I weighed 100 lbs I’d drink 50oz of water.